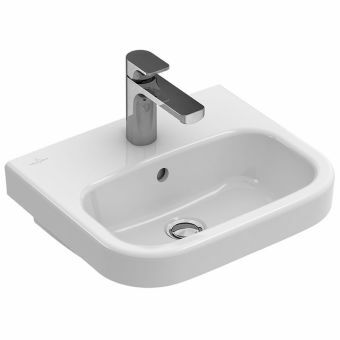 Villeroy and Boch Venticello Large BasinFrom £650.40 inc.VATLarge 800 or 1000mm wide wall mounted modern basin, with optional towel rails for either side in stainless steel. 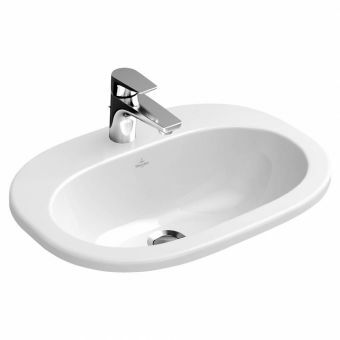 Villeroy and Boch Venticello Medium BasinFrom £297.60 inc.VAT600 or 650mm basin with 1 central tap hole, option to make 3 tap holes. Wall mounted with easy clean option. 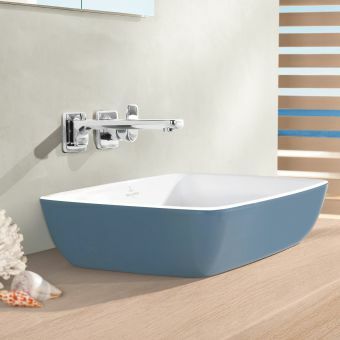 Villeroy & Boch products are made to last and will provide your bathroom with a timeless elegance. 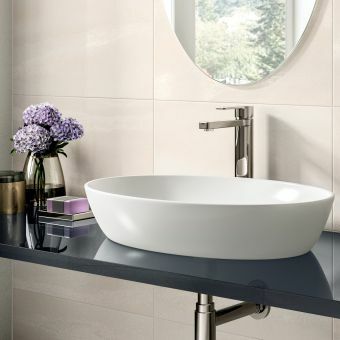 Blending stylish sophistication with technical know-how and plenty of experience, the ceramic basins from Villeroy & Boch come in a wide range of styles to suit every home. It is easy to focus on functionality when it comes to the bathroom, but there is no need to compromise the décor of your home with the large number of different options of shape and design offered by Villeroy & Boch. 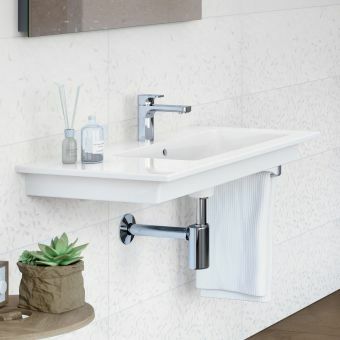 The clean, streamlined feel of a contemporary-styled home can be continued into the bathroom, whether you choose a classic basin with a modern twist, or go for something wholly minimalist and on trend. 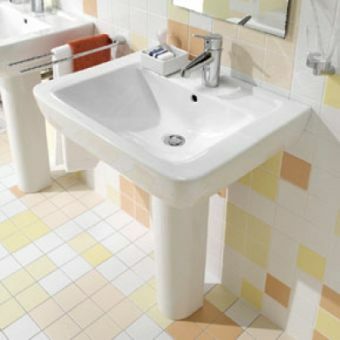 Things you need to consider when updating the basin in your bathroom include style, shape and size, as well as the cost. When considering basin shape, as well as which overall look you want, it is vital that you take into account the shape and size of the room it is going in. 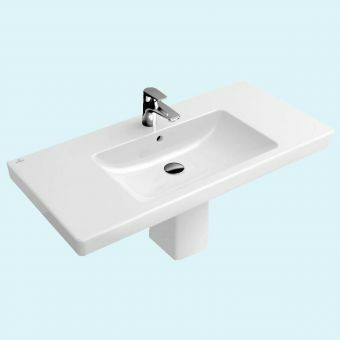 Clever, space-saving corner basins are perfect for the smaller bathroom, cloakroom or en-suite, with many designed specifically for small spaces. 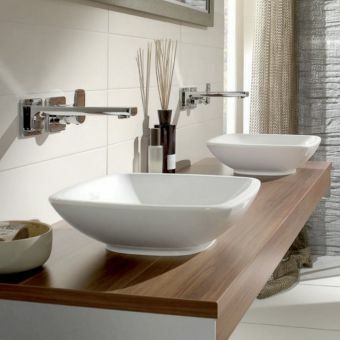 Villeroy & Boch offer compact, stylish and contemporary basins that will suit any smaller room. For the bathroom with plenty of space to spare, there are numerous other options, including double basins and larger single ones, bringing a touch of grandeur to your bathroom. 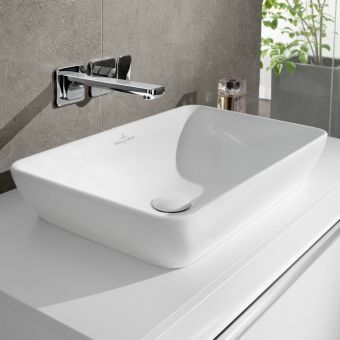 Most Villeroy & Boch basins are offered with the option to upgrade with the patented Villeroy & Boch CeramicPlus, a highly tested factory treatment formulated to repel dirt, which protects surfaces against staining and limescale. 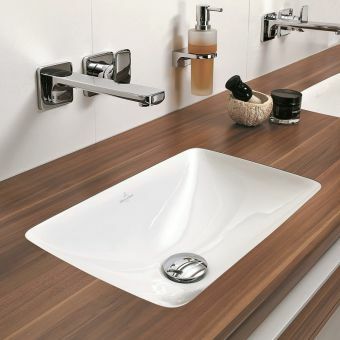 This makes Villeroy & Boch's products perfect not only for the home, but also for restaurants, schools and public places and enables you to rest assured that your basin will stay cleaner for longer, meeting the high hygiene standards required in many workplaces. The Avento Collection features a variety of basins in different shapes and sizes, catering specifically for more compact rooms. Soft interior curves meet a streamlined, angular rim, providing nowhere for germs and grime to hide. Cleanliness and functionality combine to provide a timeless, ergonomic design that will suit any modern bathroom. 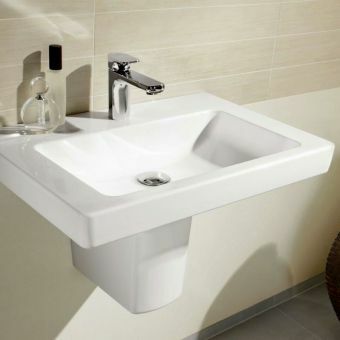 Whether you have a small space or a larger bathroom, the Subway 2.0 range from Villeroy & Boch has a minimalist, easy-to-clean washbasins in a variety of sizes. 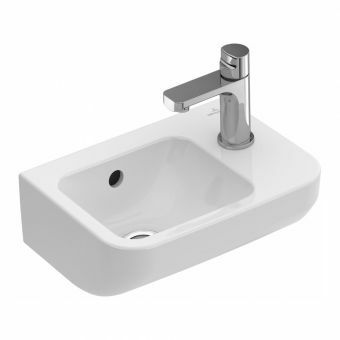 For the smaller space, the Subway 2.0 Compact Washbasin combines style with a practical solution for space saving. With bold minimalist style, clean lines and versatile design, the Subway 2.0 range will fit seamlessly into the contemporary home or workplace. The curves of the Subway (SoHo) collection provide a softer design to complement your style. With a choice of wall-hung, counter-top or semi-recessed basins, in a variety of sizes, there is something for every room, no matter how much space you have available. The semi-countertop basin combines functionality and style, with all pipework concealed within the furniture, providing storage space that is scarce in most bathrooms. Incorporating cupboard space in your new bathroom allows you to minimise clutter, giving the room a more organised, spacious and clean feel. A modern take on a classic design, the O. Novo collection seamlessly fuses functionality and style. Easy-to-clean surfaces make it quick and simple to maintain a beautifully clean bathroom. 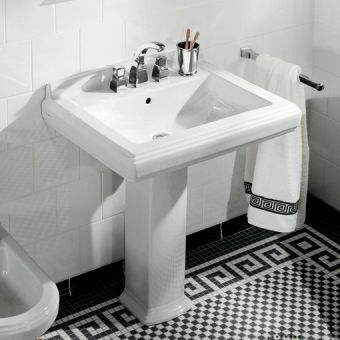 The attractive lozenge-shaped basins are simple and easy to slot into any room, with various sizes and options available, including wall-hung, offset, compact and the 1920s-inspired double basin washing trough, perfect for those who like to share but still have their own space. 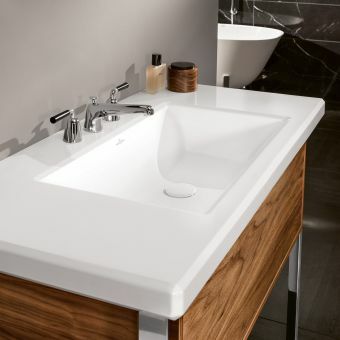 Designed with small spaces in mind, the Omnia Architectura basins provide streamlined style and elegance that are accessible to those with a limited budget. Quality is uncompromised to provide a lower cost option, enabling everyone to have a modern and stylish bathroom. 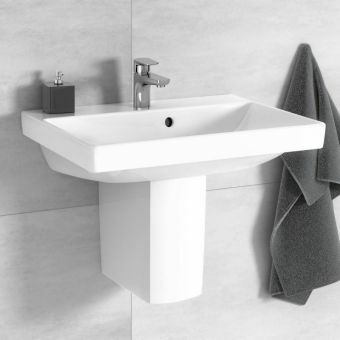 With a choice of four different sizes, the Omnia Architectura wall-hung basin can be combined with a full or semi pedestal, concealing the pipes and plumbing to provide a clean, modern and stylish look. 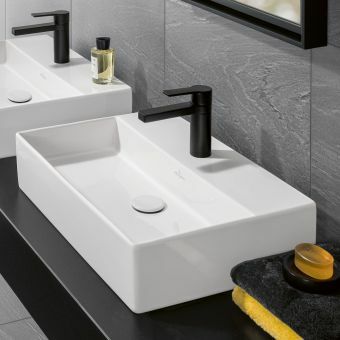 With a variety of streamlined basins, which include counter-top, wall-mounted and under-counter options, the Architectura collection provides bold angles paired with curved edges to give a striking design that will be a feature of the bathroom. The beautifully designed basins are available in square, round and oval forms, so you can find the perfect fit, no matter how much room you have available. 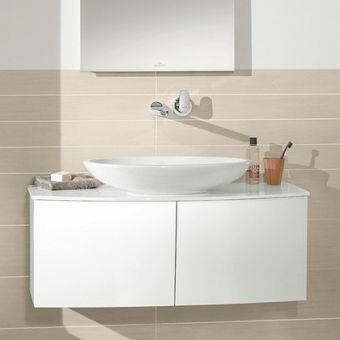 If you are looking for something for the bathroom that is more organic, with smooth lines, you cannot go wrong with the Architectura Stadium Surface Mounted Washbasin, which looks stunning mounted on a wood or marble worktop. With sumptuous curves and clean lines, the Loop & Friends basin comes in a variety of designs to suit any bathroom. The stunning minimalist design combines with practical insight to provide a basin that will be the talking point of the bathroom. 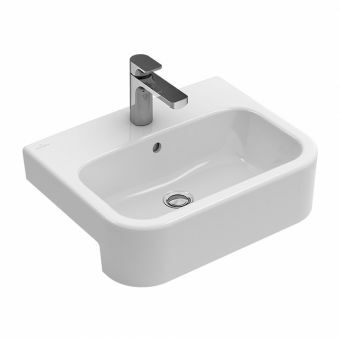 The Loop & Friends Square Surface Mounted Washbasin features an unusual rounded square design. This soft shape is perfectly paired with a wood, marble or modern material surface. 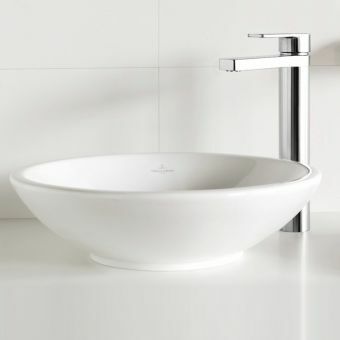 Continental design meets minimalist style with the wall-hung Aveo washbasin from Villeroy & Boch. 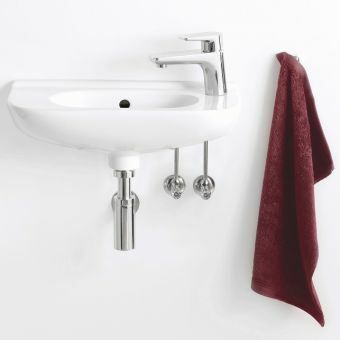 This sculpturally-designed, tactile piece will fit comfortably in the smallest of cloakrooms, providing a touch of luxury. A modern take on classic design, with the Hommage collection you have a choice of a wall-hung, counter-top or pedestal washbasin. 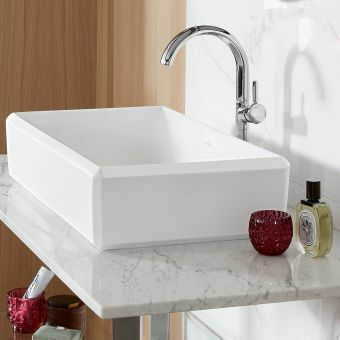 Classic lines have been given a modern twist with this range of basins that feature a larger wash area, making it perfect for the family bathroom. With sleek, space-saving designs, there are a number of options in the Joyce range. 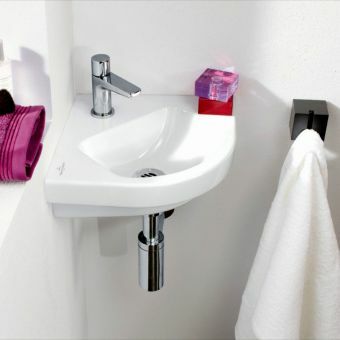 From the compact corner Joyce Handwash basin to the Joyce Double Vanity Washbasin, there is something for every bathroom. 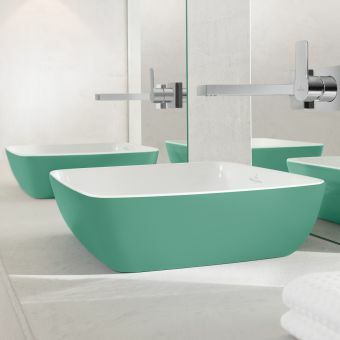 Clean lines and simple, thoughtful design mean that all of these basins will fit comfortably in a minimalist bathroom. Squared corners and straight lines provide a geometrically inspired design that will suit any style. 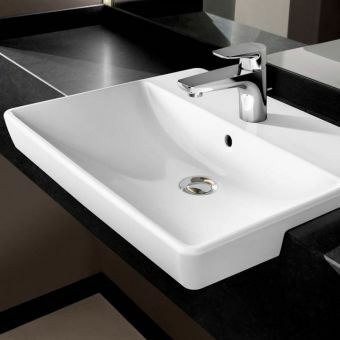 With multiple options, the German-designed Memento exudes style with streamlined edges and large wash area. The Memento Furniture Washbasin is a luxury worth investing in for the more spacious bathroom. For more compact rooms, the 500mm Memento Washbasin will update your bathroom instantly, providing a timeless touch of style. Accessible, practical and stylish, the Omnia Classic line caters for those with out of the ordinary needs and requirements. 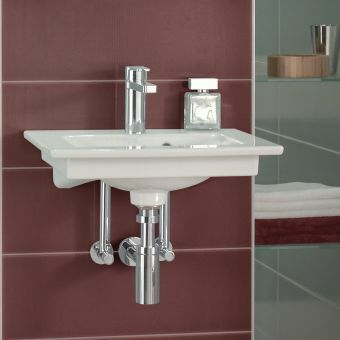 Engineered and created to take into account users with mobility or accessibility challenges, Omnia Classic provides a range of sanitary ware that does not neglect the importance of style. 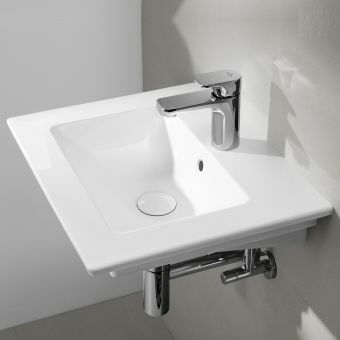 Supplying a range of basins, WCS and urinals, Omnia Classic presents variations of these items with extended profiles and integrated folding supports to make use of the bathroom as easy and natural as possible. A selection of folding and adjustable seats add a convenient and practical method of converting the walk-in shower space into an accessible unit, removing the need for major renovations or rearrangements. By choosing Omnia Classic, the bathroom remains usable by all. 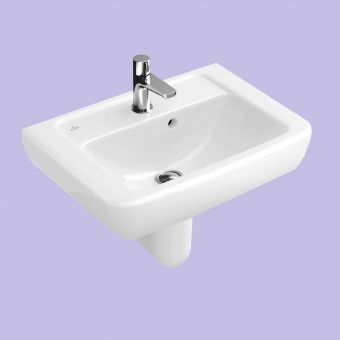 Designed with the professional in mind, the classic Belfast sink and Edwardian style has been given a modern update that will be equally at home in the bathroom, utility room, laundry or behind the scenes in a commercial kitchen. 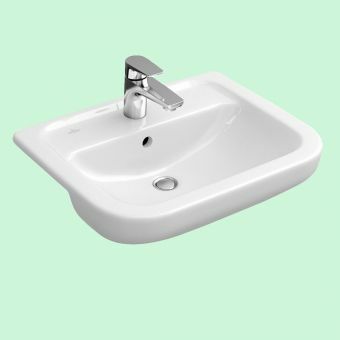 The Omnia Pro Service Sink offers style and practically, catering for numerous needs in any setting, including utility rooms, workshops or classrooms. Generous dimensions and an optional folding grid provide a useful basin area, well suited for filling or emptying buckets. 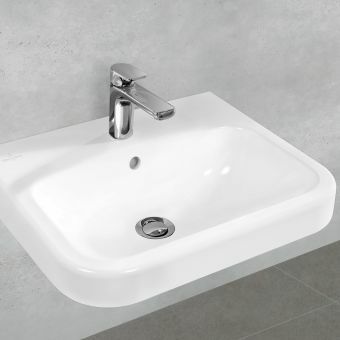 With the option to upgrade to Villeroy and Boch's patented CeramicPlus dirt-repellent treatment, you can keep your basin spotlessly clean, ensuring that it meets the highest of hygiene standards for longer. Timeless elegance and classic beauty combine in the La Belle collection. 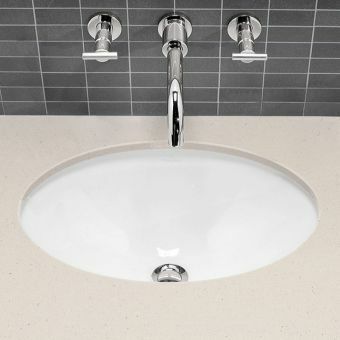 With clean lines and gentle curves, the La Belle basin will bring a touch of class to any room. The largest in the range, the La Belle 1000mm Countertop Washbasin is the only choice for the grand bathroom. 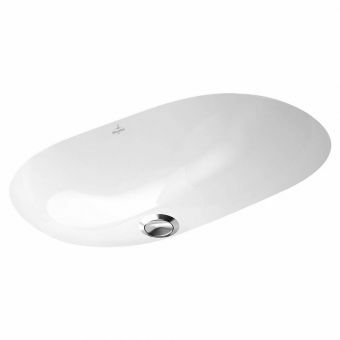 With its beautifully curved, tablet-shaped interior and squared edges, this basin exudes class and elegance. The luxury La Belle range is treated with Villeroy & Boch's CeramicPlus as standard. If your style is more organic, the My Nature collection gives you plenty to choose from. Whether you are looking for a counter-top, wall-hung or under-counter washbasin, the soft curves of the ergonomically designed My Nature collection will give your bathroom an air of purity and sophistication, while bringing the sensual touch of nature into your bathroom. 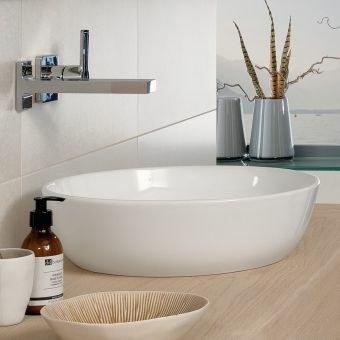 Offering a great choice of styles and sizes to fit any room, Villeroy & Boch products have been designed for both the homeowner and businesses in mind. Functionality is designed to fit seamlessly into any bathroom, so the style of your home does not have to be compromised in the bathroom. 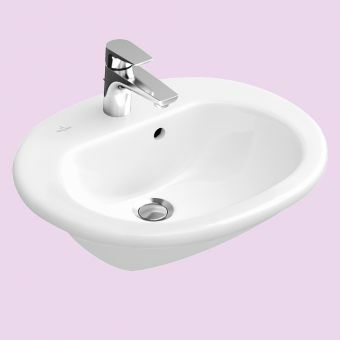 Cleanliness and hygiene are vital in any business, and with many designs tailored to commercial applications, there is a perfect basin for everyone. 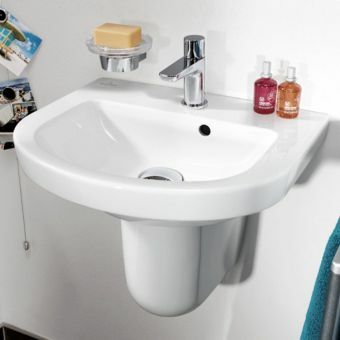 We stock a wide variety of Villeroy & Boch basins at different prices, all of the extremely high quality that will last. Villeroy & Boch have been designing and making bathroom ware since 1748, so you know you are going to get high quality that will last. With that much experience in creating bathrooms that customers love, you can guarantee that there is something for every bathroom, no matter how big or small, and safe in the knowledge that the product quality is extremely high. 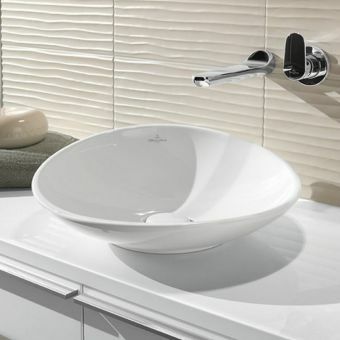 Villeroy & Boch basins are loved by all.